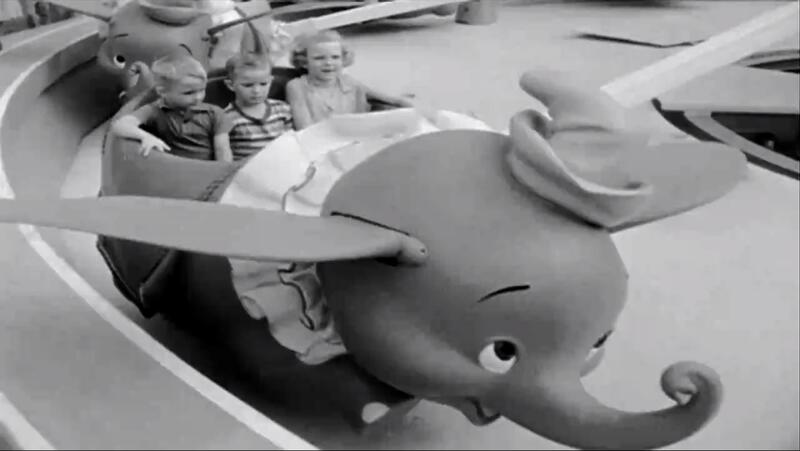 On August 16, 1955, Dumbo Flying Elephants opened to the public in Fantasyland at Disneyland. Originally, the attraction was supposed to open with the park on July 16, 1955. However, there were…..issues. Let’s head on over to Yesterland for a bit of history…. The first batch of fiberglass elephants arrived about three weeks before the opening days. They weighed 700 pounds apiece—which is light for an elephant, but heavy for a flying elephant. The ride was a mechanical failure. The attraction was quickly reworked and managed to open August 16, 1955. Notice the hinged ears (above). The ears are supposed to move up and down. I’m sorry. They’re not working today. To be honest, the mechanisms never worked properly, so the ears on each Dumbo are stationary. But that’s okay, because these elephants fly anyway. Indeed, they did fly! However, as noted on Yesterland, the ears were later fused to Dumbo’s head, the non-operational hinges removed totally. Somehow, I think this was best in the long run….one can imagine riders trying to grab at the moving ears and ending up with pinched or even broken fingers in the process! Hmmmm…..PINK elephants? Is this a misprint? I mean, the elephants in the attraction are grey! 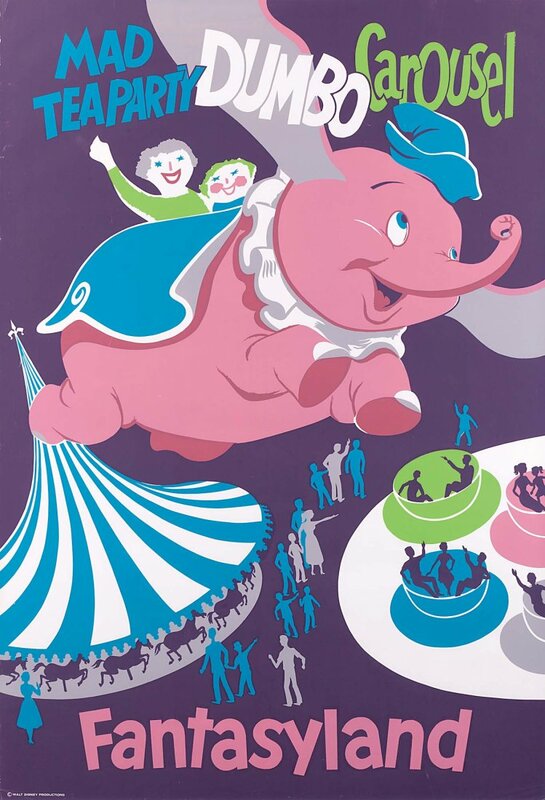 Well, according to “The Nickel Tour”, also cited by Yesterland in their post, the original attraction elephants were to represent the pink elephants that Dumbo and Timothy saw in their drunken dream in the original film. This is because there is only ONE Dumbo in the film, but there are many pink elephants! Somewhere along the way, no doubt, Walt decided he’d rather have everyone riding the real Dumbo, not an alcohol-induced hallucination. So the pink elephants became gray and the one and only Dumbo became ten. Apparently, Walt wanted to limit hallucinogenic attractions to Alice in Wonderland! This entry was posted in Disney World, Disneyland, Fantasyland and tagged Disneyland, Dumbo, Dumbo Flying Elephants, Fantasyland, Magic Kingdom, The Nickel Tour. Bookmark the permalink.